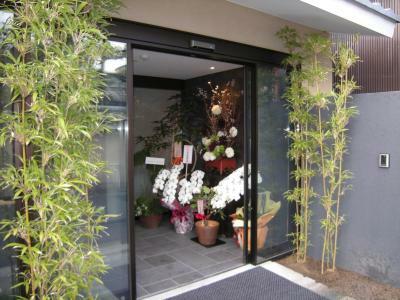 Lock in a great price for Hana-Touro Hotel Gion - rated 9.2 by recent guests. Locations was excellant, rooms small but modern and comfertable. Nice bathroom with wooden tub. Hotel quite new. We loved the superior room, it’s more spacious and has a great view. The Hotel appears newly built to a high standard which is amazing since it’s location is in the famous Gion district (where geishas + Maikes hang out). But it is still within walking of all major shopping and tourist areas and good restaurants. We were happy to have found the Hotel and will recommend it to all Friends. PS we really liked Will who manages the Hotel with great care+ concern. Job well done! 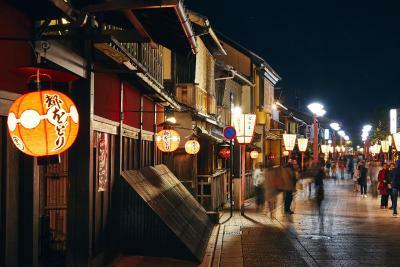 Great location at Gion. 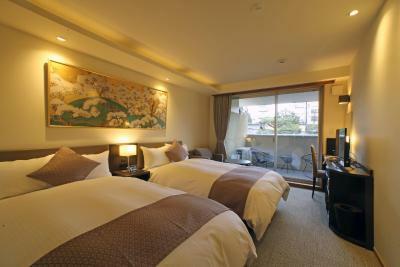 Beautiful hotel with balcony, Tatami, Japanese style table, small kitchen, coffee machine all in room! Nice staff at the front desk. Hotel staff will confirm checkin time through email about one week before. Better confirm it as no front desk staff for checkin before 8am and after 9pm. They will send you the passwords to checkin by yourselves. Good arrangement. 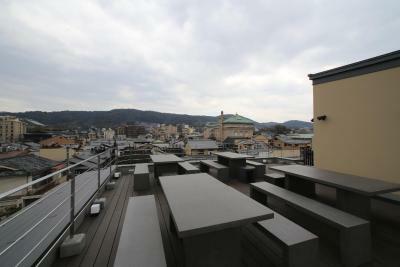 The accessibility of the location to Gion and train stations. The staff were generally friendly and helpful. The room was spacious, clean and comfortable. It was great that there were books and CDs made available to us in the room. Was also thrilled that each room had its own PIN number that we used to get in - no fumbling with room keys or cards. Location is great for the temple area but close to walk into the market and centre. The room was a good size with excellent facilities. The staff were very helpful. The hotel doesn't serve breakfast but it is available close by. Definitely recommend this hotel. The hotel exceeding our expectations. Hotel and room were super clean & the staff were kind and professional. We loved it & would recommend it to our friends. 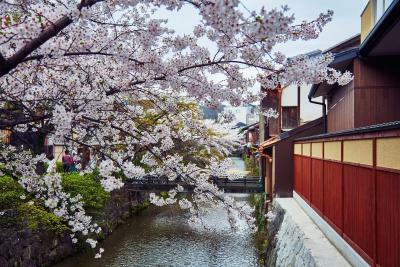 The Hotel is in an excellent location from which to explore this wonderful part of old Kyoto. The 3 rooms we had were all excellent. Clean and well designed. Traditional wooden bathtubs a great feature. The staff were helpful with restaurant suggestions and helpful with our onward travel needs. The manager in particular is a great asset and very personable. 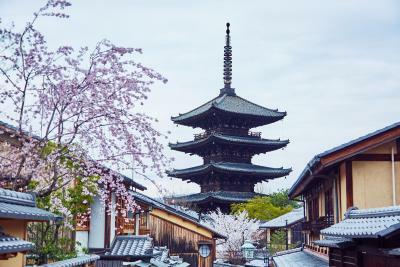 One of our top picks in Kyoto.Open from March 2017, Hana-Touro Hotel Gion offers modern Japanese-style rooms and decor. 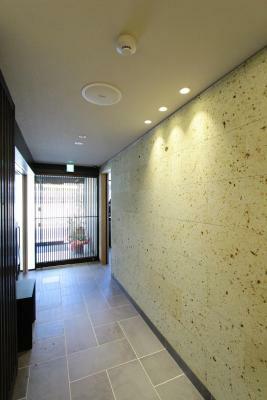 The property is situated on the south side of the Gion area. 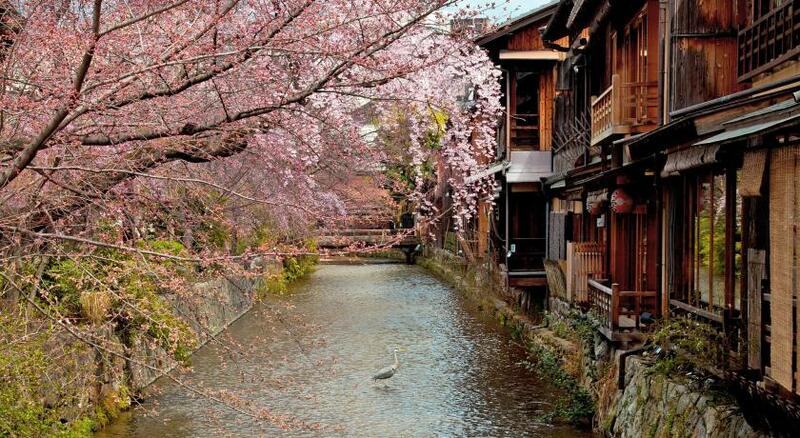 The renowned Geisha district Hanami-koji Street is a minute's walk away, while the Kaburenjo theatre and Kennin-ji Temple are a 2-minute stroll. 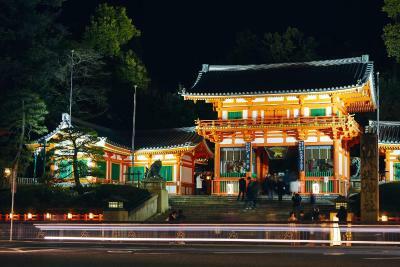 Yasaka Shrine is a 4-minute walk. 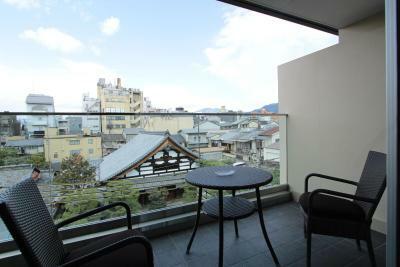 Some guest rooms boast a balcony which offers scenic views of local temples, the Higashiyama district as well as that of the Daimonji. 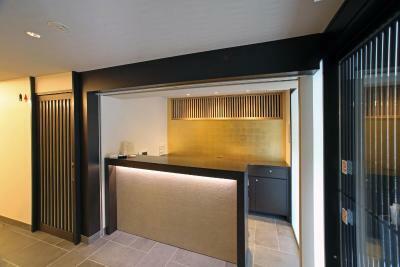 The ground floor lobby features a Japanese-style restaurant and a concierge desk, which offers kimono and bike hire. 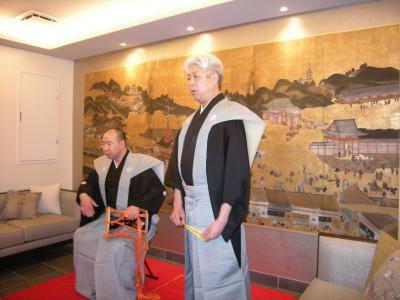 The concierge desk also offers Japanese tea ceremony, flower arrangement and calligraphy activities, as well as dinner arrangements with Geisha performers. 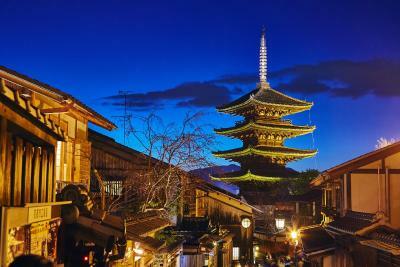 Hana-Touro Hotel Gion has been welcoming Booking.com guests since 26 Dec 2016. 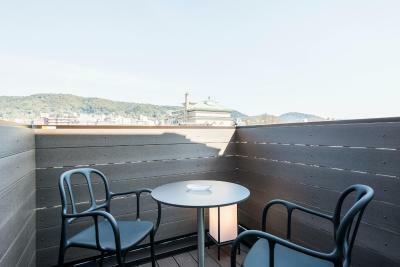 When would you like to stay at Hana-Touro Hotel Gion? This twin room features traditional Japanese-style decor such as a folding screen with gold leaf and ukiyo-e, or woodblock prints of traditionally Japanese motifs. 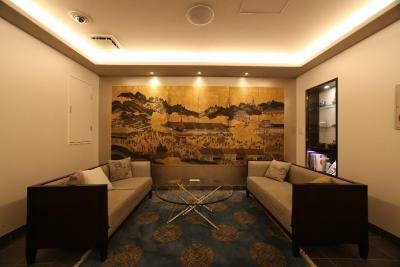 Guests can enjoy the view of Joko-in Temple from the balcony of this room. 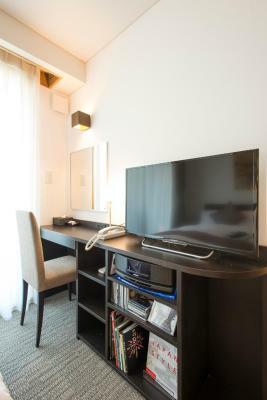 The room is equipped with 2 Sealy small double beds (120 cm wide), TV and BOSE audio set. The kitchen has a microwave, refrigerator, coffee maker and basic kitchenware. 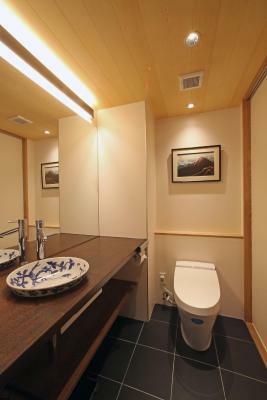 This room has a private bathroom with a bath made from Chinese black pine wood. 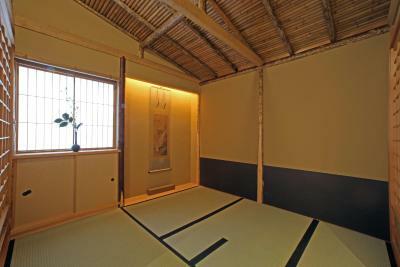 This room features traditional Japanese-style decor such as a folding screen with gold leaf and ukiyo-e, or woodblock prints of traditionally Japanese motifs. 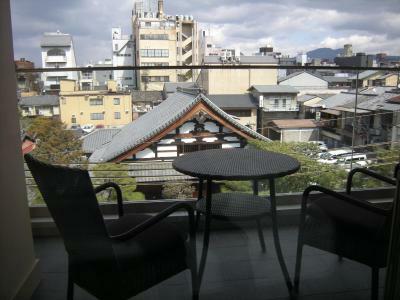 Guests can enjoy the view of a hanamachi, or a Japanese geisha district, in Kyoto from the balcony of this room. 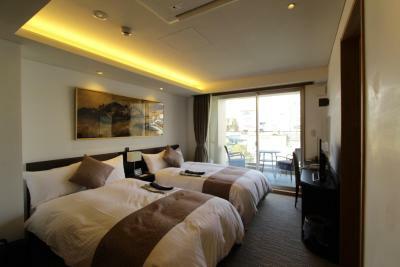 The room is equipped with 2 Sealy beds (113 cm wide), TV and BOSE audio set. The kitchen has a microwave, refrigerator, coffee maker and basic kitchenware. 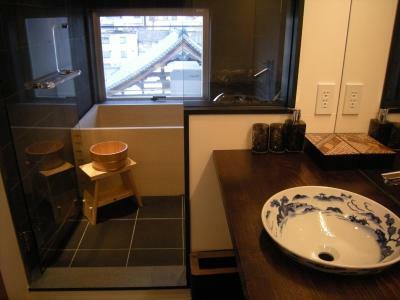 This room has a private bathroom with a shower and a bath tub made from Chinese black pine wood. This room features traditional Japanese-style decor such as a folding screen with gold leaf and ukiyo-e, or woodblock prints of traditionally Japanese motifs. 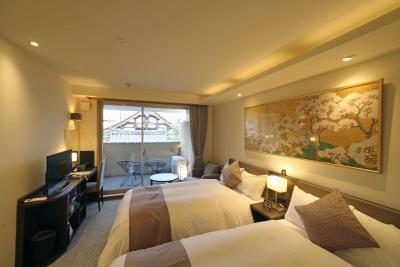 Guests can enjoy the view of Higashiyama mountains from this room located on the 4th floor. 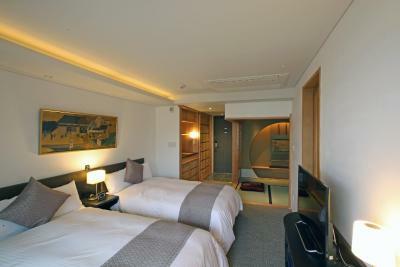 The room is equipped with 2 Sealy beds (113 cm wide), TV and BOSE audio set. The kitchen has a microwave, refrigerator, coffee maker and basic kitchenware. 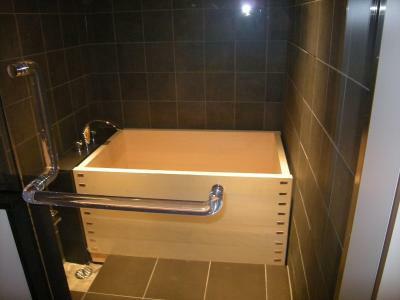 This room has a private bathroom with a shower and a bath tub made from Chinese black pine wood. This superior room features traditional Japanese-style decor such as a folding screen with gold leaf and ukiyo-e, or woodblock prints of traditionally Japanese motifs. 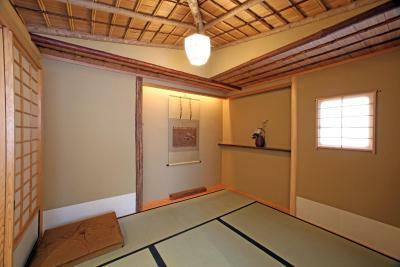 There is a room with tatami (woven-straw) floors where guests can sleep on futon mattresses. 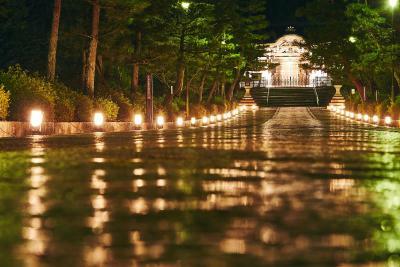 Guests can enjoy the view of Joko-in Temple from the balcony of this room. 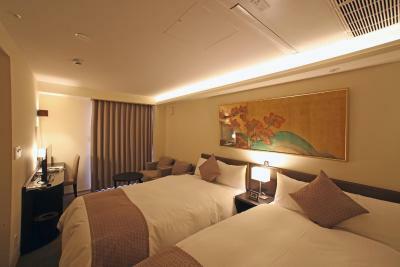 The room is equipped with 2 Sealy beds (113 cm wide), TV and BOSE audio set. 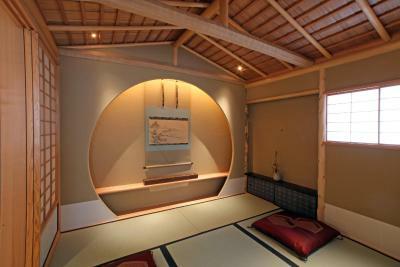 The Japanese tea-room-style kitchen has a microwave, refrigerator, coffee maker and basic kitchenware. 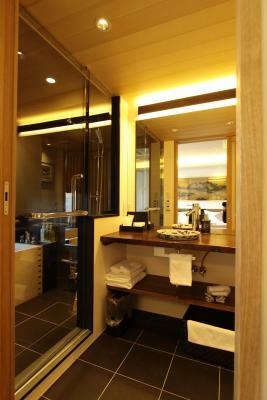 This room has a private bathroom with a shower and a bath tub made from Chinese black pine wood. This superior room features traditional Japanese-style decor such as a folding screen with gold leaf and ukiyo-e, or woodblock prints of traditionally Japanese motifs. 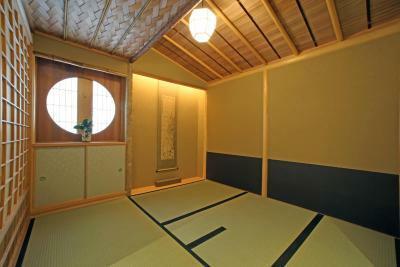 There is a room with tatami (woven-straw) floors where guests can sleep on futon mattresses. 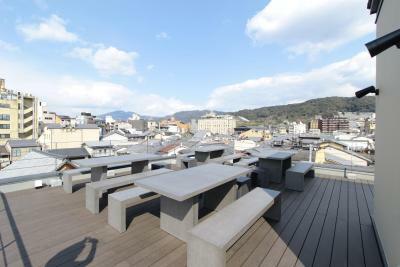 Guests can enjoy the view of Higashiyama mountains from the balcony. 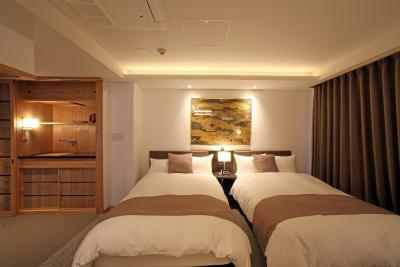 The room is equipped with 2 Sealy beds (113 cm wide), TV and BOSE audio set. 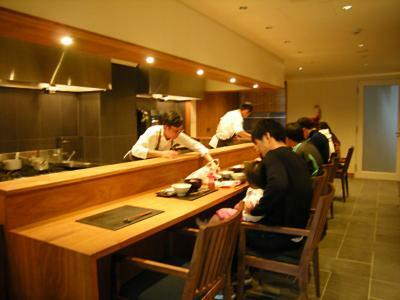 The Japanese tea-room-style kitchen has a microwave, refrigerator, coffee maker and basic kitchenware. 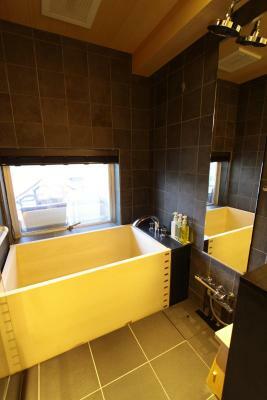 This room has a private bathroom with a shower and a bath tub made from Chinese black pine wood. 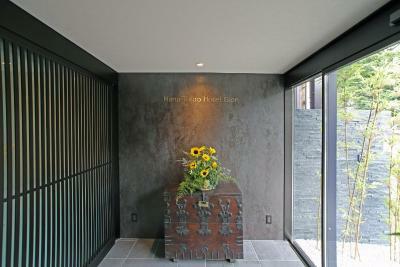 House rules Hana-Touro Hotel Gion takes special requests - add in the next step! Hana-Touro Hotel Gion accepts these cards and reserves the right to temporarily hold an amount prior to arrival. Please note that adult rates are applicable to children 6 years and older. Please contact the property for more details. Guests arriving after check-in hours must inform the property in advance. Contact details can be found on the booking confirmation. If the property is not informed, the booking may be treated as a no-show. Hotel is pretty bare bones. More like a 2 star as far as service and emenities. Staff did not go above and beyond. No breakfast Cleanliness was average. Not a huge deal, but forgot to bring coffee to the room one day. Good area of town for first time visitors. Coffee machine in room. Staff made restaurant reservations for me, called a cab for me. We really loved everything about this hotel. The beds were so comfortable and the room had everything we needed. There is a mini fridge and microwave along with dishes and cutlery so we were able to have breakfast at the table on the balcony. The staff was friendly and took care of anything we needed. The location was great — quiet side street but convenient to everything in the area. Wouldn’t change a thing! No breakfast or food service at all. No staff at night or early morning, which makes it diifcicult to get service e.g send luggage. The bathroom particualalry the tub was far from clean - hair in tub and dirt=it was so digusting we decided not to have th b ath after filling the tub. When we compalined they merely said that they would dicsuss with cleaning staff, but that was the only response we got. 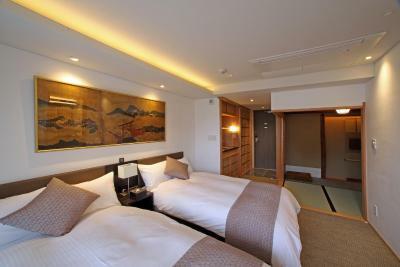 I very much liked this small boutique hotel in the heart of Kyoto’s Gion district. 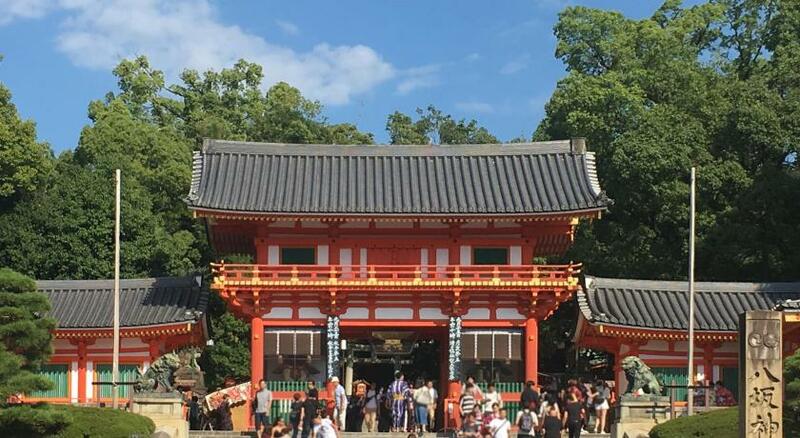 It’s in a quiet side street of famous Hanamikoji Dori and very close to Yasaka Shrine, Kenninji Temple, Chion-in Temple and several other sightseeing spots. 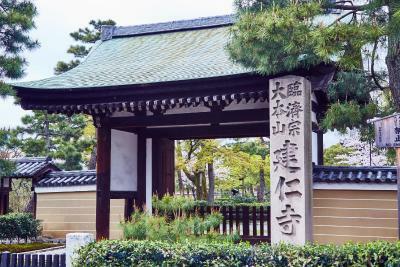 It is also conveniently close to Gion-Shijo railway station and thus well connected by foot and public transportation. The hotel itself is modern with a Japanese handwriting - everything seems to be pretty new, is very accurate and of good quality. The bed was very comfy, too, which is not necessarily something you can expect in Japan (where beds tend to be too hard for my taste). The room has a coffee machine with Nespresso capsules, a kettle (and some tea), a fridge with complimentary water and, in my case, a balcony facing a small temple on the other side of the street. Staff spoke English very well and was super friendly - I was provided with a map with sightseeing tips that I found pretty useful. There are restaurants aboard in walking distance, as are shopping opportunities. 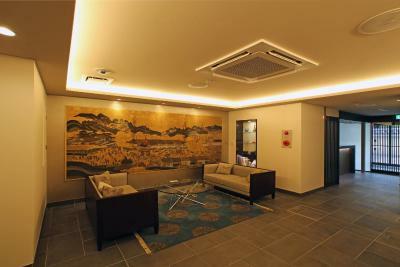 This hotel is situated perfectly in the Gion district, central to a lot of sites. The staff was incredibly helpful and welcoming. I would definitely stay here again! Room size is decent. Bathroom is nice. Convenient location. Staff is friendly.